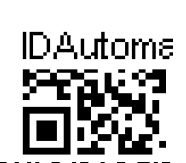 We just bought the following license: IDA26-MCDL "IDAutomation Java Linear + 2D Barcode Package (Mid-Size Company Developer License)". Please send us the file, ASAP. It appears that you may have had the demo version downloaded and installed at one point. Reboot the server or computer that is creating the barcodes. Look at the CLASSPATH environment variable and examine every directory in the CLASSPATH. In Windows, it is viewed by typing in the command line “SET CLASSPATH” at the prompt. Remove the associated DEMO packages that were installed. Remember, these can be installed either as JAR files or in a directory structure such as com.idautomation etc. Download the purchased product again from the download link. Place the new downloaded product in the CLASSPATH. It may be necessary to re-compile the application depending on the implementation. Restart the server or computer that is creating the barcodes. A restart is usually necessary because the classes can be cached. Ben I have tested the download that you received and it is the sale version--there is no demo information. recommend deleting ALL of the .jar files, reboot the machine and then re-download the zip from the store. The "Size" and the "Last Modified Date" of the file IDAQRCode.jar (download from the purchased product) same as the demo version. Is this normal ?